"Since many years scientific men engaged in the study of physics and electrical research have taken it for granted that certain quantities, entering continuously in their estimates and calculations, are fixed and unalterable. The exact determination of these quantities being of particular importance in electrical vibrations, which are engrossing more and more the attention of experimenters all over the world, it seems to be important to acquaint others with some of my observations, which have finally led me to the results now attracting universal attention. These observations, with which I have long been familiar, show that some of the quantities referred to are variable and that, owing to this, a large portion of the technical literature is defective. I shall endeavor to convey the knowledge of the facts I have discovered in plain language, devoid as much as possible of technicalities." "It is well known that an electric circuit compacts itself like a spring with a weight attached to it. Such a spring vibrates at a definite rate, which is determined by two quantities, the pliability of the spring and the mass of the weight. Similarly an electric circuit vibrates, and its vibration, too, is dependent on two quantities, designated as electrostatic capacity and inductance. The capacity of the electric circuit corresponds to the pliability of the spring and the inductance to the mass of the weight." "Exactly as mechanics and engineers have taken it for granted that the pliability of the spring remains the same, no matter how it be placed or used, so electricians and physicists have assumed that the electrostatic capacity of a conducting body, say of a metallic sphere, which is frequently used in experiments, remains a fixed and unalterable quantity, and many scientific results of the greatest importance are dependent on this assumption. Now, I have discovered that this capacity is not fixed and unalterable at all. On the contrary, it is susceptible to great changes, so that under certain conditions it may amount to many times its theoretical value, or may eventually be smaller. Inasmuch as every electrical conductor, besides possessing an inductance, has also a certain amount of capacity, owing to the variations of the latter, the inductance, too, is seemingly modified by the same causes that tend to modify the capacity. These facts I discovered some time before I gave a technical description of my system of energy transmission and telegraphy without wires, which, I believe, became first known through my Belgian and British patents." "In this system, I then explained, that, in estimating the wave-length of the electrical vibration in the transmitting and receiving circuits, due regard must be had to the velocity with which the vibration is propagated through each of the circuits, this velocity being given by the product of the wave-length and the number of vibrations per second. The rate of vibration being, however, as before stated, dependent on the capacity and inductance in each case, I obtained discordant values." "Continuing the investigation of this astonishing phenomenon I observed that the capacity varied with the elevation of the conducting surface above the ground and I soon ascertained the law of this variation. The capacity increased as the conducting surface was elevated, in open space, from one-half to three-quarters of 1 percent per foot of elevation. In buildings, however, or near large structures, this increase often amounted to 50 percent per foot of elevation, and this alone will show to what extent many of the scientific experiments recorded in technical literature are erroneous. In determining the length of the coils or conductors such as I employ in my system of wireless telegraphy, for instance, the rule which I have given is, in view of the above, important to observe." "Far more interesting, however, for men of science is the fact I observed later, that the capacity undergoes an annual variation with a maximum in summer, and a minimum in winter. In Colorado, where I continued with improved methods of investigations begun in New York, and where I found the rate of increase slightly greater, I furthermore observed that there was a diurnal variation with a maximum during the night. Further, I found that sunlight causes a slight increase in capacity. The moon also produces an effect, but I do not attribute it to its light." "The importance of these observations will be better appreciated when it is stated that owing to these changes of a quantity supposed to be constant an electrical circuit does not vibrate at a uniform rate, but its rate is modified in accordance with the modifications of the capacity. Thus a circuit vibrates a little slower at an elevation than when at a lower level. An oscillating system, as used in telegraphy without wires, vibrates a little quicker when the ship gets into the harbor than when on open sea. Such a circuit oscillates quicker in the winter than in the summer, though it be at the same temperature, and a trifle quicker at night than in daytime, particularly if the sun is shining." "Taking together the results of my investigations I find that this variation of the capacity and consequently of the vibration period is evidently dependent, first, on the absolute height above sea level, though in a smaller degree; second, on the relative height of the conducting surface or capacity with respect to the bodies surrounding it; third, on the distance of the earth from the sun, and fourth, on the relative change of the circuit with respect to the sun, caused by the diurnal rotation of the earth. These facts may be of particular interest to meteorologists and astronomers, inasmuch as practical methods of inquiry may result from these observations, which may be useful in their respective fields. It is probable that we shall perfect instruments for indicating the altitude of a place by means of a circuit, properly constructed and arranged, and I have thought of a number of other uses to which this principle may be put." "It was in the course of investigations of this kind in Colorado that I first noted certain variations in electrical systems arranged in peculiar ways. These variations I first discovered by calculating over the results I had previously noted, and it was only subsequently that I actually perceived them. It will thus be clear that some who have ventured to attribute the phenomena I have observed to ordinary atmospheric disturbances have made a hasty conclusion." Experiments to further ascertain the influence of elevation upon capacity. The coil referred to on a previous occasion was finished with exactly 689 turns on a drum of eight feet in length and 14" diam. The wire used was cord No. 20 as before stated so that the approximate estimate of self-induction and other particulars holds good. The coil was set up upright outside of the building at some distance to reduce any errors due to the influence of the woodwork. From the building extended a structure of dry pine to a height of about sixty feet from the ground. 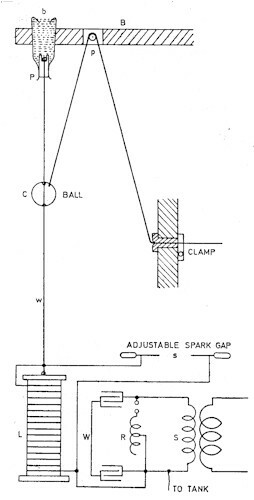 This framework supported, on a projecting crossbeam, a pulley (wood) with cord for pulling up a ball or other object to any desired height within the limits permitted and this beam also carried on its extreme end and close to the pulley a strong glass bottle within which was fastened a bare wire No. 10, which extended vertically downward to the top of the coil. The bottle was an ordinary Champagne bottle, from which the wine had been poured out! and the bottom broken in. It was forced neck downward into a hole bored into the beam and fastened besides with a cord. A tapering plug of hard wood was wedged into the neck and into this plug was fastened the wire. The bottle was finally filled with melted wax. The whole arrangement is illustrated in the sketch shown in which b is the bottle with wooden plug p supported on beam B also carrying pulley p, over which passes the cord for pulling up the object, which in this case is shown as the sphere C. The spheres used were of wood and hollow and covered very smoothly with tin foil and any points of the foil were pressed in so as to be below the surface of the sphere. . . .